$500 Seniors Event In the Money! We are down to the final 35 players in the $500 NLHE Seniors event. All remaining players are now guaranteed at least $1,158. 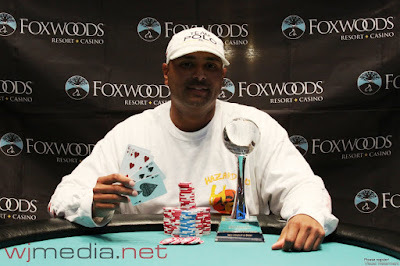 Claudangelo "Hazardous88" Beaudouin has won the $400 Omaha High/Low Eight or Better event at the Foxwoods World Poker Finals. He takes home the trophy, leather jacket and $13,323. Beaudouin and Sergio Vargas made a small save deal when play got heads-up. The players in the $500 Seniors NLHE event are currently on dinner break. There are 74 players remaining with top 35 finishing in the money. 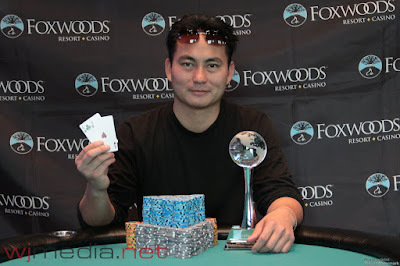 Quan Quach Wins the $600 NLHE Event! When play was down to four-handed in the $600 NLHE event, Quan Quach, John Malagisi, Joseph Weinstock and Nick Palma did an equity chip chop, leaving $12,000 on the table for the winner. In the end, Quan Quach came back from the short-stack after the deal to take the trophy, leather jacket and $28,595! We had a total of 331 players in the $500 Seniors NLHE event at the Foxwoods World Poker Finals. The $400 Omaha High/Low Eight or Better event at the Foxwoods World Poker Finals is back underway. Twenty players remain and the blinds are currently 1,500-3,000 with limits of 3,000-6,000. We are down to the final table of ten in the $600 No-Limit Hold 'em event. Bad Beat Jackpot over $400,000!!! As if you needed another reason to come out to Foxwoods while the World Poker Finals is running, the Hold 'em Bad Beat Jackpot is currently at $419,701!!! Day Two of the $600 NLHE event is set to get underway at noon. Of the 357 players who started the event, 15 moved on to today's action. $500 Seniors No-Limit Hold 'em Underway! The $500 No-Limit Hold 'em Seniors event at the Foxwoods World Poker Finals in now underway.